It's Monday morning at SAS Global Forum; the conference gets into gear today. Yesterday evening the 4,000 attendees in San Fancisco attended the Opening Session and heard SAS senior staff describe the key topics for the event. All were centred around the phrase: strength in numbers. It was the first Opening Session I've seen in many years that featured so much statistical capability of SAS software. Clearly, SAS see their strength as being able to take "big data" and not just do pretty graphs and animated pie charts but to do real industrial strength statistical analysis and predictive analytics and to help their customers influence their own future rather than simple draw graphs of the past. There wasn't a great deal of novel technical content yesterday evening but Jim Goodnight did mention that v9.4 will be available n June 2013 and its architecture is geared towards the cloud (whether it be internal virtual machines, or true off-premise hosting). And, SAS will soon be making a web-based version of Display Manager available. The whole Opening Session was broadcast live on the internet and is now available to watch at http://www.livestream.com/sasglobalforum. On a personal note, I enjoyed a cycle ride with friends yesterday. We hired bikes from Blazing Saddles near Fishermans' Wharf, cycled across the Golden Gate bridge , had a fantastic lunch in Salito's in Sausalito (http://www.salitoscrabhouse.com), and got the ferry back to Fishermans' Wharf. It was a terrific way to get to see San Francisco from may angles, and a terrific way to overcome any jet lag! This morning, right now, I'm enjoying the keynote session with Billy Beane (ref: Moneyball, Oakland A's baseball team) and looking forward to the following Technology Connection that will reveal technical details that will influence my clients' decisions over the next year. I've never paid much attention to the SAS Global Forum (SGF) online agenda builder before. I've preferred the pen on paper approach, using the pull-out printed agenda in the conference programme. However, with the introduction of an Android version of the conference app this year, I can see the benefit of doing some planning and making life easier whilst at the conference. So, I've just been through the whole agenda (yes, all 633 paper descriptions) and made a first cut of what I'd like to see or do. As a result I've filled my Twitter timeline with scores of tweets about my sessions choices - the agenda builder tweets every time you add a session to your agenda! Inevitably I've double and triple booked myself, but I can iterate over my plans and make final decisions on the day. As always, there are some excellent topics and speakers. I won't be able to see all of them so I'll have to apply a degree of discipline to my choices. And I need to make sure I take time to make a good trawl of the demo area, speaking to the developers and product managers, and thereby getting information from the horses' mouths re: directions and futures for SAS products that are key to my clients. This year I shall have a heightened interest in life sciences and clinical products, so SAS Drug Development (SDD), SAS Clinical Data Integration (CDI), and JMP Clinical are on my hit list. So much to do, so little time in which to do it! The good news is that I've already packed and so I'm ready to catch my flight tomorrow morning. While I'm packing for my trip to SAS Global Forum, I thought I'd share some San Francisco pictures with you. There's a link at the end of this article. They're by Trey Ratcliff, who almost shares a surname with me, and they cover a mixture of San Francisco scenes plus visits to tech companies in the region. The shot of "Alcatraz in the Dusk" (on page 3 of the San Francisco collection) is one of my favourites but I've chosen a classic view of the Golden Gate bridge to illustrate this article. Scoll down the page of Trey's shots and blog articles to see some wonderful work - including the Alcatraz shot. They won't help you with SAS or software development, but I hope you like them. Who knew?! There's been an iPod app for SAS Global Forum (SGF) for the last couple of years but now there's an Android equivalent. Hurrah! I didn't see any publicity about its availability; I just discovered it today. It's fab. I can see all the sessions; build an agenda; make contact with other conference goers; use maps of the venue (slightly cumbersone because I have to break-out to a browser and then download independant PDFs). You can find it on the conference's mobile page (surprise!). As I write this, it's the afternoon of Sunday 21st April. 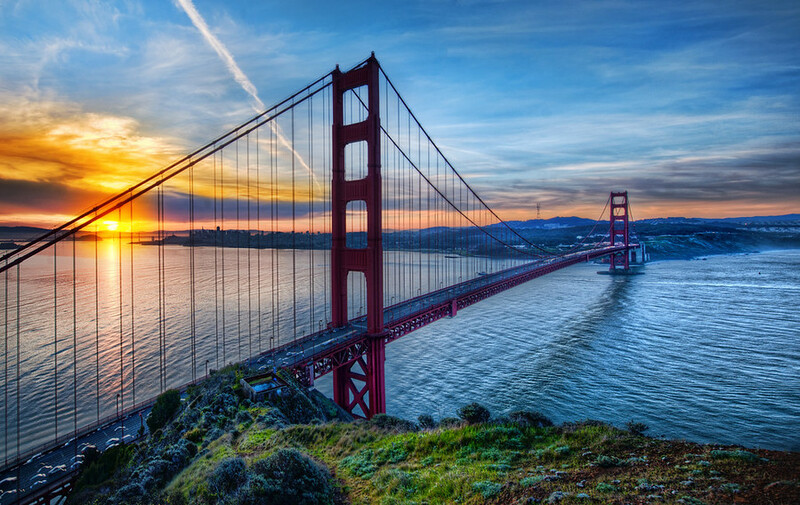 In a week's time I shall be in sunny San Francisco, indulging in a cycling tour of the area with friends in anticipation of the SAS Global Forum opening mixer in the evening. I'll probably be a wee bit sleepy, having had a long day on the previous day. I'm expecting Saturday to be an especially long day because I'll need to rise at 7am British Summer Time to catch the 12:20 Virgin Atlantic flight, and I'm planning to attend the Tweetup in the evening. But the Tweetup is at 8pm Pacific Time, and TimeAndDate tells me make that that is 4am Sunday in British Summer Time. As I said, a long day, and I may not stay long! I didn't attend the Tweetup last year because of the long day plus the travel distance/time between my chosen hotel and the Tweetup location. This year, I have no such excuse because the Tweetup is in the same hotel as me. I look forward to meeting the organisers (Tricia Aanderud (@taanderud) from And Data, and Michelle Homes (@HomesatMetacoda) from Metacoda), plus lots of other fellow tweeters (tweeps?). It'll be an informal gathering, and non-tweeters are welcome (although, you might be under firm pressure to become a tweeter!). As my kids have got older and have had to make decisions about which subjects to continue, and which to drop, I've paid closer attention to the general trends in some specific areas. Whilst I'm not sure that either of my kids will follow in my footsteps, I've paid attention to career changes in and around the SAS world. One of the very clear and visible trends is the increase in data-related, analytical roles. In March this year, icrunchdata reported an increase in statistics-related jobs from 16,500 three years ago to 28,305 this year. As more and more data becomes more and more readily available for analysis, demand for the business benefits that skilled analysis of that data can offer continues to accelerate. When it comes to analytics careers, analytic department bosses and businesses are interested in one particular, ephemeral skill: curiosity. As Greta Roberts (faculty member for the International Institute for Analytics and VP at vendor Talent Analytics) put it, finding curious and cutting-edge analytic team members means it's "important for business to move beyond being dazzled by software skills." Technical skills such as Hadoop, Hive or SQL are valuable, but it's the ability to derive information and knowledge from the data that really counts. Analytic tools such as SAS Visual Analytics allow the analyst to increasingly focus on the analytics without the friction of dealing with the data. Jeff Hammerbacher (Founder and Chief Scientist of Cloudera, and one of the first 100 employees at Facebook) has been quoted as saying "data is the IT of our generation". In other words, in Jeff's view computing is no longer an issue or a barrier, the analyst is only limited by their own skills, knowledge and curiosity. So, I'm encouraging my kids to follow their interests and strongest subjects, but I'm also encouraging them to make their best efforts in maths. If they subsequently read statistics at university and go on to become data analysts then maybe I could say they had followed my footsteps.